Learning a new language challenges us for many many reasons (that’s one many for each of my attempts to learn Spanish). And while there are tons of programs and tools out there to meet the growing global need to pick up a second language, the problem with most of them is that they were not designed specifically for each individual’s needs. Or at least that was the case before Lingualia. Lingualia is an online, language learning platform where instead of students adapting to the course, the course adapts to the students. “How so?” you ask. In charge of the program is Lingu, a made-to-measure teacher based on Artificial Intelligence that responds to each student’s progress. Beginning with a short test to gauge proficiency and place students, Lingu creates a learning experience suited for the learner. In essence, Lingu learns how the student learns, and adapts accordingly. Classes cater to individual skill levels, motivation, time available and progress in different areas. Falling behind or feeling like you can’t converse with other students is so discouraging. It makes you want to give up or shut up, when talking is exactly what you need to keep doing for improvement. Because the course material moves with you, there’s no running aground or going off track with Lingualia. No matter how slowly you advance, you’re always moving forward. Courses cover these key areas of language acquisition – vocabulary, pronunciation, grammar, and comprehension. Lingu uses dialogue and checkpoints to test if you’re really understanding your new lingo. 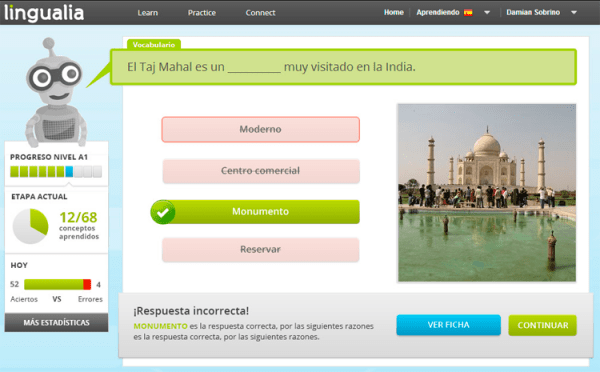 Your customized teacher also revisits problematic material to help you continue advancing and retain information. The personally-tailored teacher is an incredible tool, but Lingualia is a flexible course in other ways. There’s no traditional classroom or strict time rules – you can sneak in five minutes here, three hours there. Lingualia syncs across mobile devices, tablets, and desktop, so you can learn on the go, wherever and whenever is most convenient. You have complete freedom and control to learn at your own pace and rhythm. 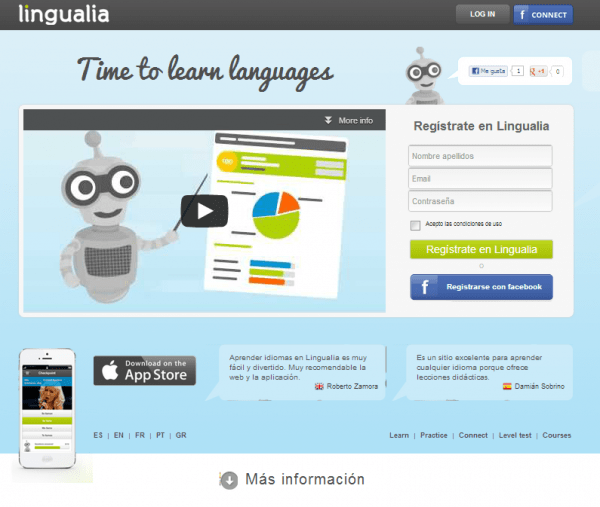 Lingualia also offers an online community of native speakers to converse with in real-time chats. There’s only one way to overcome the awkwardness of speaking in a foreign language – by speaking more! An online community is a tremendous resource for practicing, receiving feedback, asking questions, and even making friends. Currently, you can find Lingualia at the website or in the App Store. Course content (which changes to meet your progress, of course), designed by education professionals, covers 4 levels, with over 200 lessons and 8,000 audios. Material addresses real and practical situations. A basic membership is free, while a negotiable premium membership offers additional learning materials and services. At this time, Lingualia offers Spanish and English courses. 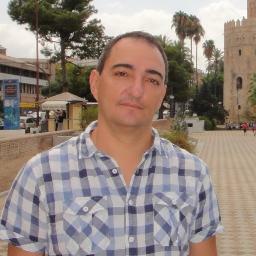 CEO and Co-founder Sergio Blanco published his first website when he was just 23 years old (www.todoprogramas.com). Later he served as the Internet director at don Quijote, one of the largest Spanish language schools in the world. His experience with language learning inspired him to create Lingualia. It’s easy to be hard on yourself when learning a new language. Lingualia and Lingu make sure that you’re always making progress, putting fun back into the adventure and minimizing a lot of the growing pains. Buena suerte!